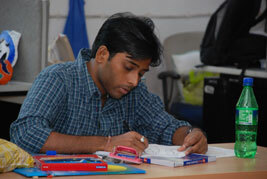 The next day students had a list of objects in their respective theme topic. The lifestyle products with wire - group had a list of products which can be made with wires like tissue paper holder, soap holder, magazine holder, etc. Water storing devices were also with a list of possible ways to store water for example buckets, tanks, glasses, bottles, jugs, pitcher, etc. LED reading light group were ready with a list of reading light applications for example portable book light, bed side light, lights for traffic police, etc. The pull along wooden toy group was full of list of animals, insects and everyday objects like cars, buses, etc. which can be used as a subject for pull-along toy. But, professors soon understood from the discussion with students that no one was able to decide on the topic for further exploration. So, groups were given feedback collectively by discussing each one’s case. 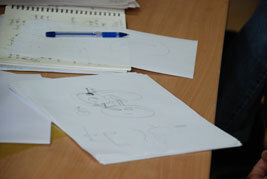 While discussing with students, Professors were also going through the student’s drawn ideas. • Other possible ways in which bucket can be used – for example table, washing machine drum, etc. • Needs of users like sweeping floor, washing clothes, bath, pouring water in drum or washing machine or in garden, etc. • Possibility of new material and process for bucket manufacturing and so on. 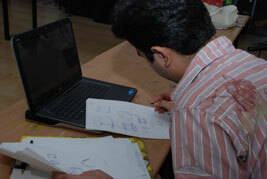 Investigation in each area with a designer’s perspective will yield a new solution. The solution then can be successfully marketed by its Unique selling proposition (U.S.P.). 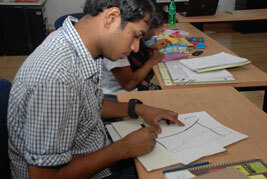 Professors also reminded students about the first day fun exercise of designing a wash-basin for specific users. 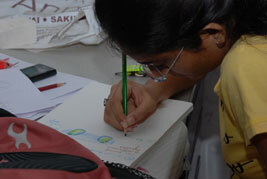 Students were designing bottle shapes, earthen pot shapes, LED table lamp shapes; all of that was just an unrestricted exploration resulting in more confusion. 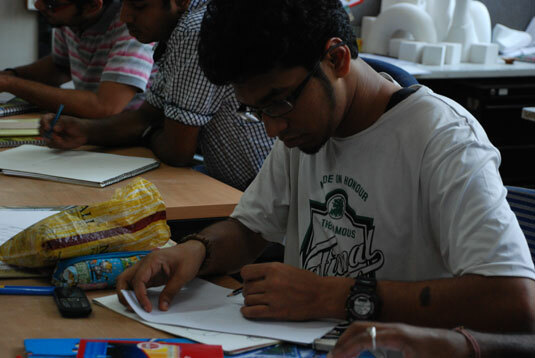 Professors asked each one of the students to define the user and user profile for their chosen topic or contraption.